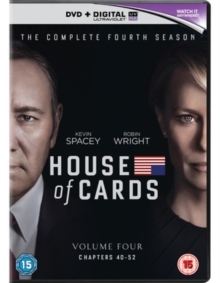 All 13 episodes from the fourth season of the award-winning political drama starring Kevin Spacey. Based on the novel by Michael Dobbs and the subsequent BBC adaptation of the book, the show follows Francis Underwood (Spacey), a politician whose sense of ambition is matched and encouraged by his wife Claire (Robin Wright). Armed with an arsenal of political secrets to equal anyone in Washington, Francis is more than willing to scheme and blackmail his way to the top. In this season, Claire begins campaigning for her own place in Washington, Francis makes a political move that angers Russia and Claire clashes with the Secretary of State.